PM Theresa May met with Chief of the Defence Staff Air Chief Marshal Sir Stuart Peach and Ministry of Defence Permanent Under Secretary Stephen Lovegrove. This morning the Prime Minister met with Chief of the Defence Staff Air Chief Marshal Sir Stuart Peach and Ministry of Defence Permanent Under Secretary Stephen Lovegrove. They were joined by the heads of the Navy, Army and Air Force as well as Commander Joint Forces Command. The 90 minute meeting covered the full extent of current operations, including those against Daesh in Iraq and Syria, support to the NATO mission in Afghanistan and tackling the migrant crisis in the Mediterranean. The PM reiterated the UK’s determination to keep Britain’s streets safe by taking the fight to Daesh in Iraq and Syria and noted that we have conducted more than 1000 airstrikes in both countries, second only to the US. The Defence Chiefs and the Prime Minister went on to discuss the investigations into allegations of abuse by Armed Forces personnel in Iraq. The Prime Minister spoke of her pride in the UK armed forces, and praised the work they do to keep our nation safe. She said that every effort must be made to prevent any abuse of the legal system, and restated her determination to protect the armed forces against any instances of vexatious complaints. 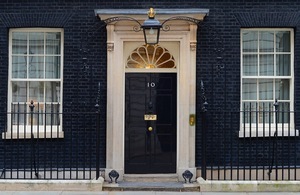 The Prime Minister was also briefed on international relationships, and how the Ministry of Defence and the three services were working to enhance engagement with a growing range of partners, for example delivering on the bilateral Lancaster House defence agreement with France in order to improve interoperability between the countries’ armed forces. They discussed steps being taken to enhance the United Kingdom’s commitment to United Nations operations and NATO. The Prime Minister noted that the UK is more than doubling our contribution to UN peacekeeping and playing a leading role in NATO by leading the rapid reaction force in Eastern Europe in 2017. The Chiefs set out the extent to which the Armed Forces were acting positively to promote the nation’s interests around the world including Royal Navy efforts to protect shipping against pirates off the Horn of Africa and in ensuring sea lanes in the Gulf remain open. The Prime Minister was then updated on measures being taken to develop a more sustainably diverse workforce in Defence. She welcomed initiatives to reach out to wider communities within the United Kingdom in order to broaden Defence’s recruiting base, and was briefed on the development of more flexible career structures, and the importance of Reserves and Cadets. Taking note of the considerable requirement for advanced technological skills across the workforce, she reaffirmed her support for development of apprenticeships across the Defence enterprise. The men and women of our Armed Forces do an incredible job, often making huge sacrifices to keep us safe. Whether taking the fight to Daesh in Iraq and Syria, helping to tackle the migrant crisis in the Mediterranean or providing flood relief at home – we owe them a huge debt of gratitude. Our Armed Forces are the best in the world and with the biggest defence budget in Europe and the second biggest in NATO we will continue to play our part on the world stage, protecting UK interests across the globe.